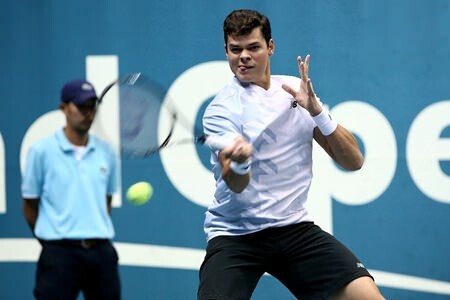 Number three seed Milos Raonic of Canada denied top seed Tomas Berdych of the Czech Republic his first title of the year, with a 7-6(4), 6-4 victory in front of a packed Impact Arena stadium in last Sunday’s singles final of the Thailand Open 2013 in Bangkok. Both players held serve strongly through the first set with the exception being the twelfth game which saw Raonic save the only break point he faced in the match to force a tiebreaker. 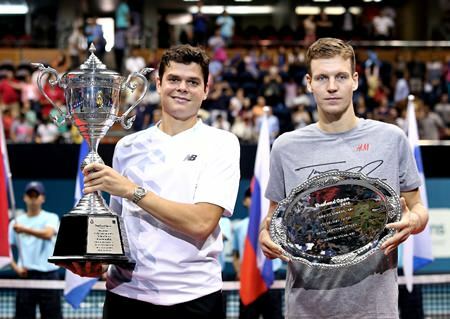 Milos Raonic (left) hoists the champion’s trophy after defeating Tomas Berdych (right) in the final of the Thailand Open 2013 in Bangkok, Sunday, Sept. 29. But it was the Canadian who gained the only mini-break on the first point of the breaker with a down-the-line return winner off the forehand side. He maintained the advantage to win the tie-break 7-4. The second set saw Raonic quickly grab the only break of the match, in Berdych’s first service game. The world #11 was then in cruise control as he sealed his first Bangkok title, the fifth of his career. Raonic powers a forehand past Berdych in the final. “I think I struggled a lot more than him (Berdych) in the beginning. He found the rhythm better. In that tie-breaker, it just really came down to that one return and he was playing pretty solid after that. That return sort of gave me a little bit of a boost. It sort of gave me an insight on what I needed to do. 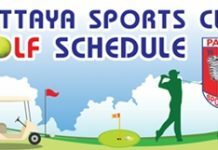 I started to be more aggressive and tried to put the return in and to take control,” said the 2013 Thailand Open champion at the post-match press conference. In the Doubles final, #3 seeds Britain’s Jamie Murray and Australia’s John Peers captured their third title of the year, defeating fourth seeded pairing of Tomasz Bednarek of Poland and Johan Brunstrom of Sweden 6-3, 3-6, 10-6.